Use free, printable wedding favor boxes to give your guests a little gift to thank them for taking the time to come to your wedding. These boxes can hold any type of small wedding favor, bulk candy being one of the most common and inexpensive items for the boxes. All the wedding favor boxes listed here are free and can easily be printed from your home computer. They all come with directions indicating where you should cut, fold, and glue or tape to make your wedding favor box complete. We suggest printing the wedding favor boxes out on cardstock so they are heavy enough for you to put favors inside. Heavy scrapbook paper or even photo paper will work too. The wedding favor boxes can be topped with a free customizable tag or a wedding label and also act as place cards for your reception, showing the guests where they should sit. Find more free wedding templates for invitations, programs, table numbers, and menus. There are more wedding freebies available including a dress, flowers, catalogs, and thank you cards. Style Me Pretty has some very cute printable wedding favor boxes that look like they have a top but really is one complete box. 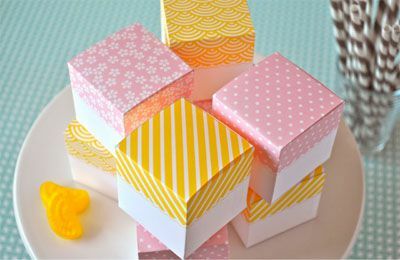 You can print these wedding favor boxes along with the instructions in yellow stripes, yellow waves, pink flowers, or pink polka dots. Use these free wedding favor boxes, and your guests will remember them for a long time to come. These cute little boxes are shaped like ovens and are the perfect size for a cupcake or muffin. We think you could put just about anything in them and your guests will be delighted. These wedding favor boxes, shaped like adorable little apples, would match with any wedding theme, from rustic to whimsical. Print out the templates, cut them out, and then use the step-by-step directions to assemble the apple boxes. These printable wedding favor boxes from Eat Drink Chic are little tiny milk cartoons with the phrase "Happily Ever After!" on them. 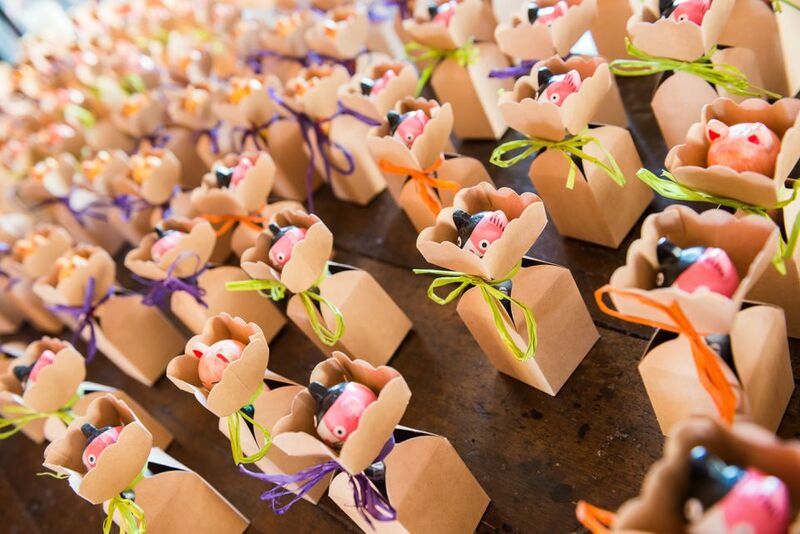 These cute favor boxes are sure to bring a smile to all of your guests. I'm thinking milk duds, miniature cookies, or any kind of white chocolate candy would look darling in them. Martha Stewart has some free wedding favor templates that make cones. Printable directions will help you assemble the cones and get them ready for the guests. You can print these free favor cones in color or black and white. Printing them on different color cardstock can change the look of the finished product, so don't be afraid to experiment. Mr. Printables has designed some geometric heart boxes that would work perfectly as a printable wedding favor box. Detailed instructions will help you make any of the styles, but I have to say that the pastel hearts are my favorite. Here's another free wedding box favor template from Style Me Pretty, this time it's a lime green box with the phrase "Love is Sweet" on the outside. These would be a great way to give your guests a sweet treat they can enjoy during the reception. Here's a free, printable wedding favor box that features a tiny bird with the word "Love". This pretty box is decorated with small pink polka dots making it lovely enough for any wedding. Print out this wedding favor box and follow the directions to make this little box in no time.